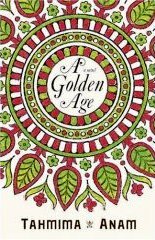 A Golden Age is Tahmima Anam's fictional account of the Bangladesh War of Independence in which her family were heavily involved. Having just flogged the Tinker (Bugle Boy father of dgr) into action to save me the trouble I suspect this telling of family history is something daughters care about and do well. I'll leave all the sons who stop by here to redress the balance in comments. I'm sure sons care too. In amongst fictional journeys to Chicago, the Crimean war and the Deep South of the USA this book was going to need to convey a keen sense of time and place to keep me returning and I'll own up that initially I was seduced by the World's Fair and seedy goings on back in Chicago. A gap of a couple of weeks and I picked up A Golden Age again at about p70 and to its complete credit I knew exactly where I was and read through until the end. This is the book I mentioned with that haunting opening line "Dear Husband, I lost our children today", you can't help but read on to find out and once this heart-wrenching early part of the story has been told the action quickly moves on to 1971 and to what was then East Pakistan in turmoil. The widowed but quitely determined Rehana and her grown up children find themselves caught up in the war and all its brutality (largely understated and hinted at apart from one or two episodes of sparse but essential and gruesome details) but set against a backdrop of the most intense sights,smells and sounds of this unique country. A land of great beauty and a microcosm of weather, religion and food all delineated to perfection by Tahmima Anam with the last remnants of colonialism resonating quietly in the background.Time and again, you feel you have been drenched by the rain and sated by the food. I could almost smell Rehana's mango pickles ripening on the roof. Choices must be made, sides must be taken and it is the women who take centre stage as they all search for their less certain roles in the conflict.It is the mothers we come to understand, through their fears for their children and always, churning away beneath it all, the effects of Rehana's early experiences which she can never quite leave behind. Another good and highly recommended read.